The Fluid Premium mesh drafting table chair from Allseating is an upgrade from the Fluid basic chair by offering a choice between a foam padded, black fabric upholstered seat cushion or a screen mesh seat available in four neutral mesh colors (the main large picture has the Oasis black fabric seat. The smaller pictures to the right have the ebony open mesh seat). Other features on this office drafting chair include an elastomeric mesh fiber backrest that helps prevent premature stretching while distributing body pressure evenly for maximized air circulation, one touch pneumatic seat height adjustment, chrome finish foot-rest, optional height and width adjustable armrests available for a minimal charge and a heavy duty five star nylon base with dual wheel carpet casters standard. This drafting chair is rated for users up to 325lbs. Meets or exceeds ANSI/BIFMA standards. Dimensions: Back Size: 23"H x 19"W. Seat Size: 20"W x 19"D. Seat Height Adjustment: 18.5" - 26.5"H for the fabric seat chair and 19.5" - 27.5"H for the mesh seat chair. Overall: 43 - 51"H x 28"W x 28"D. 10 year warranty from Allseating. 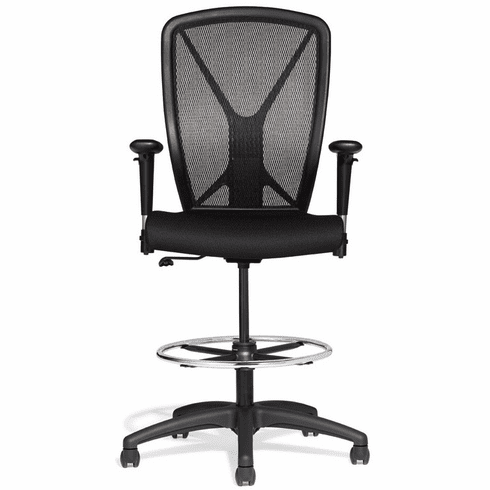 The Fluid premium mesh drafting chair normally ships in 3-4 business days from Toronto CA.